Morning: Ted Miller quotes USSM in the P-I, then jumps on the Adam Jones bandwagon. 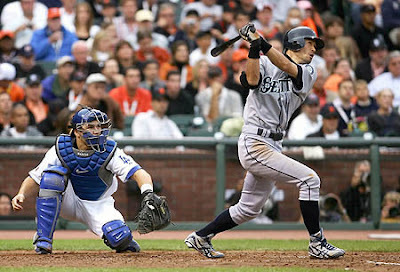 Afternoon: Ichiro re-signs with the Mariners. Evening: Ichiro goes 3-3 with the first inside-the-park HR in all-star game history. Wins All-Star game MVP award. Late Evening: Jason Churchill reports that the team will give Adam Jones a starting job and bench Jose Vidro on Thursday. I’m not exaggerating when I say this is the best single day this franchise has had since October 8, 1995. On the heels of Felix Hernandez mixing his pitches after reading our open letter, the Mariners winning 3 of 4 in Oakland while going 14 and 4 in their last 18 games, and Mike Hargrove resigning as manager, it feels like we’ve been granted access to our own personal genie. Anything that makes Jeffrey Loria cry is a good thing. t really know what you’re talking about, but the Bavasi quote up on USSM right know is hilarious. I assume by the reaction of the Marlins front office that Jeffrey Loria is vewy, vewy sad.